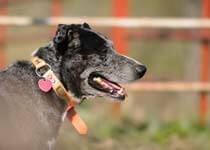 You have just arrived at the website of Tammy's Cowdogs and Goldammer Ranch. If you have cattle to work and are looking for an easier way to handle your cattle, you have certainly come to the right place. My Hangin' Tree cowdogs are excellent workers and valuable assets in all types of cattle handling situations. My website is meant to give you a "snapshot" of our days on the ranch. My cowdogs are the only source of "hired hands" when it comes to getting the cattle work done. When I use the words "we", "our" or "us" it simply means me and my cowdogs. I would not want to face a day on the ranch without my loyal, courageous and helpful partners. To keep up on the newest ranching and cowdog news follow my blog and my Facebook site. I post some of our daily working ranch news and pictures at both locations. During the year, I set aside a weekend to have a field day and an annual cowdog production sale. 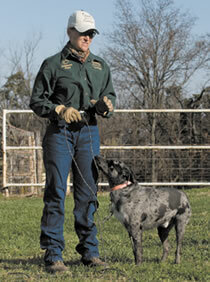 It is a fun time to come and watch cowdogs in their roles as working cowdogs, partners, friends and companions. I work cowdogs as teams, pairs, and independently. They will gather cattle, bring them to the corrals, do some sorting work, and work cattle into the alleys and to the chute. The ages of the dogs will be pups, yearlings, or older cowdogs. The cowdogs sell after the demonstrations. Saturday and Sunday are then set aside for the new owners to get buddied up with their new partners. Cattle will also be used in the “get acquainted” time. Visitors are always welcome to come and watch for the whole weekend. My annual cowdog production sale information can be found on my blog. The categories are "cowdogdays". Lodging, airport and other accommodation information can be found on my Contact page and my blog. I have a closed cowdog breeding program. Like my retained ownership cattle breeding program, I have intentionally and methodically concentrated on building a cowdog product that meets standards that I consider “must haves”. To build a better cowdog, I have concentrated on weeding out genetic traits that I find undesirable. Such as issues with hearing, eyesight, reproductive problems, physical/structural conformation problems, umbilical hernias, cancer related issues, temperament qualities, aggression issues, etc. Take a moment to read, “Tribute to Bert”. Bert sets the bar for what I want in a cowdog. If you need a cowdog, stockdog or hunting dog that has abilities outside of what Bert possessed, then you might need to search for a dog from another source. If you need a dog that can be bought, sold, traded, or swapped within cowdog clubs or associations, then I will not be able to help you. The pedigrees of my cowdogs are intellectual property of Tammy’s Cowdogs. The focus here is cowdogs with great work ethics, genetically sound, sound conformation, wonderful team players and companions. We work hard and we play hard.